Christina and I had our marriage celebration today with a small group of friends and family. 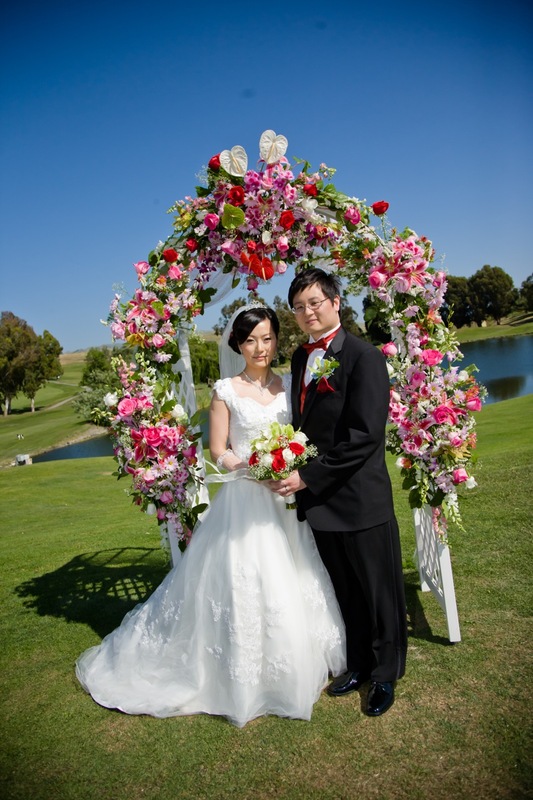 Everything went very well and Christina looked beautiful in her wedding gown and Chinese dress. We held the ceremony beside a lake (water hazard) at Summitpointe Golf Club and then had the reception afterwards in the main hall. It wasn't the most fancy venue but the outdoor ceremony was very nice and most importantly everyone enjoyed it. My friend Anthony did a great job as our ceremony officiant, reading a script prepared by one of my other friends Matt who unfortunately couldn't make it because he got stuck in Indonesia on business. We had a sand ceremony of red and blue sand that we poured into a heart-shaped vase Christina found in China. Christine, one of Christina's friends, was her maid of honor and Jasmine was her bridesmaid. Calvin was my best man and Dennis was my groomsman. Naomi wore a pretty little white dress and was our flower girl. Christina was particularly happy with the flowers that we had that day. That was probably the best decoration of the entire celebration. We took all the flowers home and they're all over our bedroom right now. Some of the other stuff didn't go as well: we didn't find out that the room wasn't going to be decorated until the day before and had to make rush arrangements to get that done and the changing room was very small and was primarily the event coordinator's office. At the reception, Dennis was the DJ and he did a really good job at it. We played 'Eyes on Me' by Faye Wong as the song for our first dance. During our dinner at the sweetheart table we had a special guest because Caitlin came to eat with us. Calvin and my mom said a few words for the toast. Christina didn't like the food that much but other people said it was good. I played a lot with Naomi and Caitlin which was lots of fun, and was happy to see Shannon and Mei-Ling again after over a year since last time. We all had a good time but we're glad it's all over so we can relax again.